Multi-purpose use for Weddings. Photo Booth / Wedding. 50 page (25 sheet) Black Leather Dry Mount Photo Album. Plain Black Leather cover with no other fancy design or pattern. Black pages with white interleaves. Multi-purpose use for Weddings. Photo Booth / Wedding. 50 page (25 sheet) White Leather Dry Mount Photo Album. Plain White Leather cover with no other fancy design or pattern. Black pages with white interleaves. Description:You can get a beautiful original design photo album to record family travel, friends, wedding, baby growth, company celebration, work photos, sweet photos Each of the creative memories images are detailed of sweet words, tells your thoughts and feelings. Love needs to be expressed. 1.Vintage brown PU leather. 2.Book bound hard back quality. 3.Leather cover photo make a really retro feeling. 4..Soft inner layer can also be used to protect the photos from dust, scratches and minor impact. 6.Great for anniversary gifts,personalized gifts,valentines day,baby shower gifts,birthday gifts,wedding guest book,photo storage,travel record. 7.This beautiful and timeless photo album will help you to think of all the precious moments in your life. .
HIGH QUALITY FINISH - Stylishly finished with book bound, this stunning photo album also includes a dedicated index page, personal information page, and a handy CD/DVD storage pocket. Large capacity, 288 pockets in total, 9 photo each page. We will endeavor to respond quickly and attempt to solve the problem with proper way. This photo album is perfect for you. Wonderful photo album you deserve it! 1 x Photo Album. - Beautiful picture design is very attractive. is a good gift. - Material: paper. 3L item 10250; self-adhesive clear polypropylene PP pockets with flap; made by 3L in Denmark. Made in Denmark, these pockets contain no PVC and no solvents. They are made from tough clear archival polypropylene, and the adhesive backing is strong and durable. 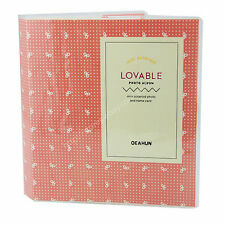 This photo album is ideal to send overseas to family and friends. It holds 40 photos so great for a gift of any special occasions. Large capacity, 288 pockets in total, 9 photo each page. We will endeavor to respond quickly and attempt to solve the problem with proper way. Detail Image. - Color: As shown. Keep your precious stories forever with this album. - Features: 64 Photo Pockets 1 Pockets outside Cover / 1 sheet of Decoration Sticker included. Instead of trying to match existing sets, we suggest that you consider replacing your existing interscrews entirely. You do NOT need to buy these extensions to go with any refills your are purchasing from us. BEAUTIFUL DESIGN AND QUALITY MATERIAL - The cover is made of soft durable PU leather, engraved with a graceful lady in a butterfly dress. This ring binder are anti-rust and easy to be opened. The black pages are thick enough so that the glue cannot go through. Covers are bound in lightly textured vinylised paper. This is an Ascot 7x5 slip-in 160 black photo album by UR1 item # 50004. The Ascot 7x5 slip-in 160 photo album will hold 160 photos 13x18 cm (7"x5") in horizontal landscape format. 1 x 120 Pockets Mini Photo Album Storage Case. Size:120 pockets fit for 3" Photos. Conditions apply. Compatibility With. Color: Grey. Even in this digital age, there’s something magical about organising and keeping photo albums. Whether you’re placing them in a box to go through later or you are setting them up for display for others to enjoy, such as in a photo album, there are many ways to keep your photos tidy and together in one spot for easy viewing. For some, scrapbooking and organising keepsakes and photos is a relaxing hobby, and it can even be a form of art. Shop varied accessories and items to help keep your photographs pristine and enjoyable for years to come. One of the most common ways to organise and showcase photos is to use a classic photo album. There are many different types of photo albums. They differ in size, material and even how the photos are displayed on the inside. For a classic, elegant look, leather photo albums and boxes work well in a home office or on a shelf in another room of the home. You may also want to consider a simple ring binder photo album, in which you can use plastic sleeves to hold photos, keeping them tidy and easy to view. Whether you’re in the midst of organisation or you have a wealth of photos, scrapbook boxes are a terrific idea. You may want to place the photos in paper or plastic sleeves before placement in the boxes to keep them free from harm, but boxes are a great way to store your photographs. Boxes are also a great choice for keepsakes, negatives and other photo accessories. Different types of sleeves and holders work with different binders. For example, some photo pages have a plastic sheath and a sticky background on which to place photographs so that they’ll stick. You can also affix some photos with gummed corners to help keep them in place. Other sleeves separate photos for you, often allowing you several standard size photographs on one page. Beyond boxes, sleeves and albums, you may want other types of accessories to display photos. In lieu of picture frames, ‘clothespins’ designed uniquely for hanging photos are a great idea. Also, you may also want to use cardstock to make your own display frames or display the photos that way in an album. Other accessories you may want to have on hand include plenty of single sleeves as well as photo-safe glue or adhesive.